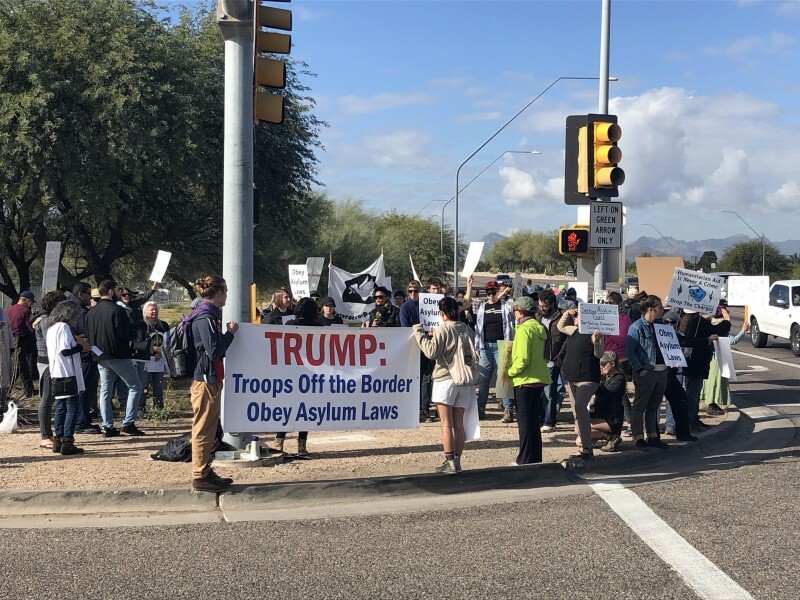 Tucson protests troops on border at Davis-Monthan Air Force base | Fight Back! 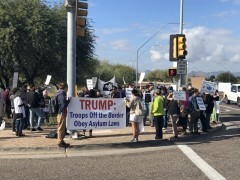 Tucson, AZ - Over 100 people chanted, “Troops off the border! Defy Trump’s order!” at the Davis-Monthan Air Force base on December 1. Signs reading “Refugees welcome here!” drew many honks of solidarity from traffic passing by the base entrance where demonstrators stood outside. After the speakers wrapped up, the group took the streets and blocked the whole intersection as the police rerouted hundreds of vehicles. “This is people power! We must build this and defeat the Trump agenda!” declared organizer Edward Cott from his bullhorn in the streets. Plans continue to build mobilization against the deployment of 15,000 troops to the Mexico border. This action was in response to the call by the Legalization for All Network for a week of national actions.